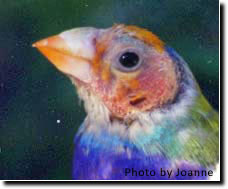 ladygouldianfinch.com - Why is my bird bald? 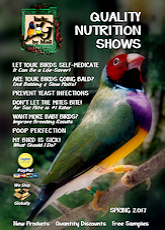 Poor Nutrition is the primary reason for balding in birds. Parents Feeding Chicks lose the facial feathers around their beaks, from feeding chicks. Infection of fungal, bacterial or parasite origin can cause feathers to fall out on the face and head leaving a crusty, rough appearance. Nutritional Balding For many years we believed that our Gouldian finches were going bald due only to the lack of Iodine in their diets. However, new research findings offered by Dr Rob Marshall suggest there are other reasons for balding in Gouldians. This article is adapted from Dr Marshall's article "Relationship of the Molt to Airsac Mite Infection in the Gouldian Finch." His research describes the relationship between airsac mite, balding, naturally completed molt, successful breeding and remedies for an abnormal molt. The Gouldian finch has a special relationship between their molt and breeding behavior as the molt primes them into breeding condition. In nature, their molt begins at the end of the dry season (between September-October) and concludes by mid to late December when Summer rains initiate breeding behavior. In order to enjoy good breeding outcomes, breeders should not allow their birds to breed between September and December. Note: Breeding should stop by January 31st in the US. During these month the Gouldian finch should be allowed to complete the molt in the shortest possible time. This goal is achieved by ensuring the flock is strong at the onset of the molt and receives adequate nutritional support throughout the duration of the natural molt, which takes about three month to complete. When the molt period is shortened for any reason, signs of an abnormal molt - especially visible on the head of a Gouldian - appear and successful breeding outcomes become less likely. The completion of the molt is an extremely important part of a successful breeding season and every effort should be made to support its natural completion. This is achieved by keeping the birds healthy during the molt period and ceasing all breeding activity by August 1, (Janurary31st in the US). Ongoing Airsac mite treatment and nutritional support during the molt will ensure the molt process normally and is completed by the beginning of the breeding season. Breeding results will be greater when the Gouldian completes its molt naturally and without any interruption. This is achieved by ensuring breeding activity stops by August 1st in warm regions � and much earlier when winter temperatures fall below 10 Degrees Celsius (50 Degrees Fahrenheit) � so that breeding pairs must be given enough time to recover from their breeding activities before they start their molt around the first of September. A compressed molt is likely when breeding or cold weather impinges upon the molt period. 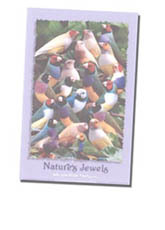 A compressed molt occurs when Gouldian finches are not given the opportunity to start their molt because breeding extends too close to the start of the natural molt season. A compressed molt may also appear when exceptionally cold weather occurs throughout. Gouldians need additional dietary energy, protein and minerals to overcome the damaging effects of a compressed molt. Abnormal head feathering, head baldness, head pin feathers and missing facial feathers, are the most obvious signs of an abnormal molt in Gouldians. 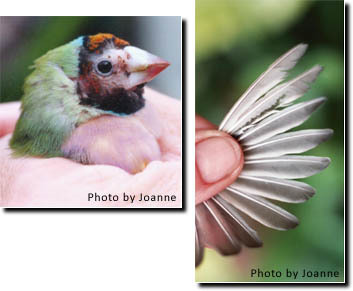 Examining the wing feathers and comparing the primary flight feather molting pattern of affected birds with that of healthy birds helps determine the most likely cause of these symptoms. A compressed molt is the most likely cause of baldness, whereas poor nutrition associated with a sudden cold spell or disease process is the likely cause of missing facial feathers and head pin feathers. Wing examination reveals the presence of multiple growing flight feathers that indicate a compressed molt. No secondary flights have been molted yet. Head baldness in the presence of multiple adjacent new growing flight feathers indicates a compressed molt and that breeding or cold weather has extended too close to the molt period. Ultimately the cause of baldness is a depletion of nutrient reserves brought on by a compressed molt. Airsac mite infestation is a likely complication of birds with baldness as they are under stress. Breeding activity is unlikely with bald headed Gouldians as they do not come into breeding condition. At first the back part of the head is bald but when untreated, the head becomes completely bald. 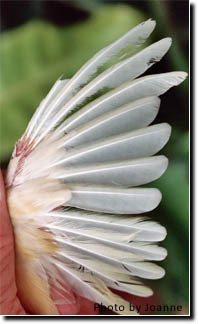 Wing examination revealing the presence of multiple growing flight feathers & damaged veins Indicates a compressed molt. When balding is untreated, the head becomes completely bald. The appearance of multiple pin feathers crowding a Gouldian's head is an indication of a sudden halt to the molt as a result of an energy and protein deficiency. Examination of the wing feathers usually reveals a normal molt pattern as this condition is not usually the result of a compressed molt. The presence of head pin feathers is a sign that the nutritional requirements of the molt are lacking or that an intestinal disease has prevented the full absorption of food nutrients into the body system. Head pin feathers are a sign that the flock is receiving a marginal and inadequate source of nutrition as the nutritional requirements of the molt peak by the time the head feathers are being replaced. This is a time of the molt when the largest feathers of the Gouldian, the outermost primary flight feathers, are also being replaced. Pin feathers appear because the long flight feathers, which are essential for survival in Nature, take precedence over the head feather for all available energy and protein. Missing facial & head feathers is the most serious form of an abnormal molt. This health problem is often associated with the nutritional deficiency that has prevented the re growth of these feathers. Inherently weak mutation Gouldians are more likely to show this symptom as they are more susceptible to stress related infections and inadequate diets. Irrespective of the underlying cause of an abnormal molt, the immediate treatment aims to restore the nutritional balance and control stress related air-sac mite infestations. Nutritional daily supplementation with protein, Turbooster, energy, Quik-Gel and E powder, minerals, Fvite. Twice weekly iodine, Ioford and vitamin, Dufoplus supplementation until head feathers re-grow (3-4weeks) and then the ongoing Molt program. Air-sac Mite Treatment. Administer an Initial treatment against Air-sac mites, S76 for two days each week for three weeks. Then continue with an ongoing treatment, S76 for one day each month, throughout the molt. 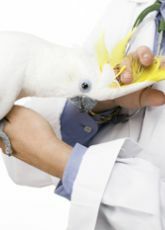 For head pinfeathers and missing facial feathers additional treatment is required as these conditions are often associated with a primary disease or secondary stress related infection. 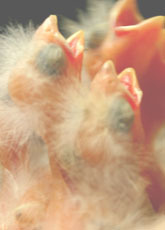 The appearance of any birds with symptoms of an abnormal molt during the Molt season indicates a nutritional deficiency is present. The deficiency may be directly related to an inadequate diet, or indirectly caused by a disease that affects the absorption of the nutrients from the bowel or a disease that weakens the bird. It is important to look at the wing feathers when investigating an abnormal molt in order to identify signs of a compressed molt which indicate the molt period has been reduced. Abnormal molt problems can be avoided and breeding outcomes improved by following a Molt Program and ensuring the birds are healthy and strong as they enter the molt period.